Jason Statham, Jon Hamm and Daniel Craig have already been less than complimentary about the world's most famous family. And now Scottish comedian Billy Connolly has come forward to blast the Kardashians, saying he would 'hate' to be a member of their brood. 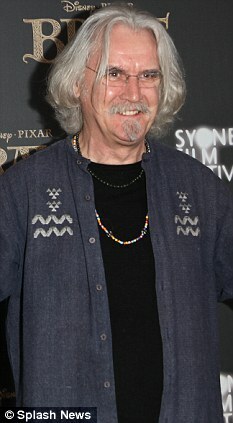 Connolly, 69, made the comments during an interview on Australian television in which he explained why he hates the culture of people becoming famous without achieving anything. He said: 'I think it's stupid to try and be famous just because you're famous. You should try and be good at something first. 'There's an awful lot of people now who aren't like the Kardashians. I would hate to be one of them. Kim and her family found fame through their reality series Keeping Up With The Kardashians, which follows the personal lives of Kim, as well as sisters Kourtney and Khloe and their extended family. Connolly, who is in Australia promoting his new animated movie Brave, added in the interview that he has learned to be 'comfortable' with his own fame, and loves meeting his fans. He added: 'Fame is great, it's very comfortable. It's comfortable because I wanted it. A lot of people don't seem to want it and they see their audience as the enemy. 'I have never really understood people who say "Oh Christ, here's the public, I better hide". Other stars to have blasted the Kardashian clan include Mad Men star Jon Hamm, who called Kim a 'f***ing idiot'. He told Elle UK magazine: 'Whether it's Paris Hilton or Kim Kardashian or whoever, stupidity is certainly celebrated. And James Bond actor Daniel Craig criticised Kim when he was asked for his opinion on the media circus surrounding Kim's divorce from Kris Humphries just 72 days after their televised wedding. He told GQ: 'You see that and you think, "What, you mean all I have to do is behave like a f***ing idiot on television and then you'll pay me millions?"